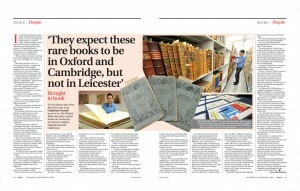 While we may be tucked away in the basement of the David Wilson Library there are plenty of exciting discoveries to be made in Special Collections, as recent media interest in our collections demonstrates. I also took part in a Q&A for the Curve Theatre Blog. The exhibition includes the poster for the new musical version of The Secret Diary of Adrian Mole Aged 13 3/4, which opens at Curve in March. 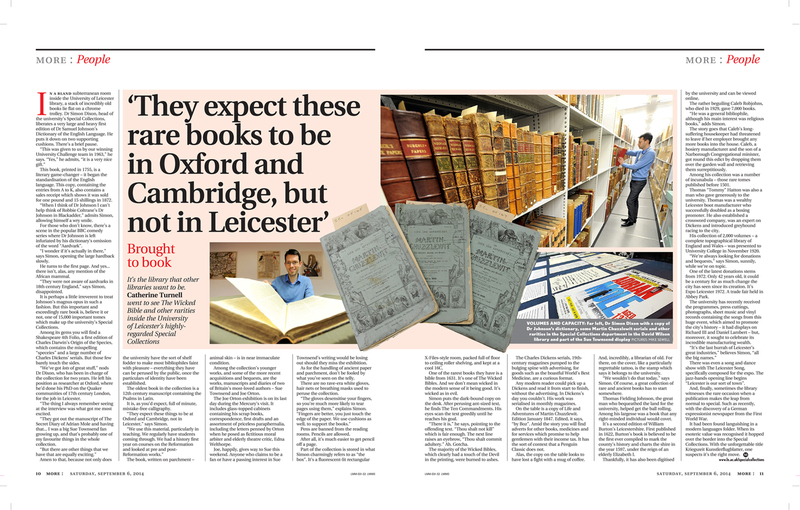 To finish off the week, the Leicester Mercury’s Saturday supplement, More Mercury, published a two page feature on our collections, describing us as ‘the library that other libraries want to be’. People are often surprised by both the richness of our collections and the fact that members of the public as well as staff and students of the University are welcome to come and consult them. I hope the recent coverage will encourage people to come and visit us to use our collections and see the exhibition.